The founder of the Watchtower Society, Charles Taze Russell was extremely fascinated with science, technology and development. This fascination led to some ideas that were embarrassing in hindsight (like pyramidology), but his approach to popular “science” was mostly positive. Russell was above all an optimist. The disappointments following the failed predictions of a peaceful new world in 1914 were probably the reason this optimism would fade from Watchtower teaching. The leadership under “Judge” Joseph Rutherford, who became President after Russell’s death in 1916, was also fascinated with technology and science. But if Russell had some strange ideas, Rutherford went over the hill and far away. Even more so did Clayton J. Woodworth, co-author of the infamous seventh volume of Studies in the Scriptures, “The Finished Mystery” (1917). In 1919 he became editor of a magazine called “The Golden Age,” which is now known as Awake! 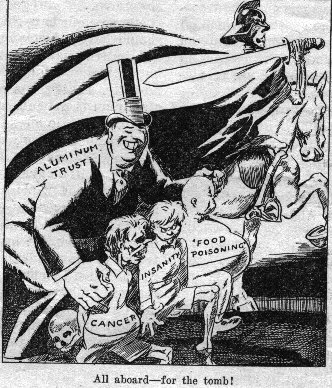 One major point in all the propaganda was the idea that aluminium cookware was the source for all sorts of horrible diseases. Jehovah’s Witnesses would therefore be very skeptical towards eating out, and might often blame a food poisoning on the cooking vessel instead of the food. You can find quite a few letters from readers in this period telling how wonderful it was that their child had been healed from various diseases by heeding the warnings in The Golden Age against aluminium cookware. Another, much more serious delusion was the idea that the medical doctors were the agents of Satan. 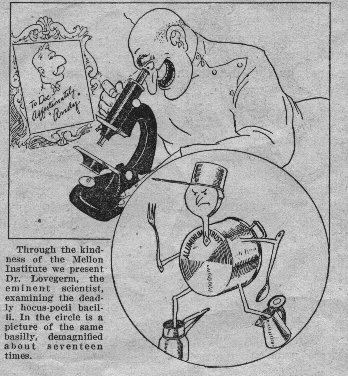 It follows naturally that with this position, the Watchtower Society was serious about denying the “germ theory of disease” as a dangerous delusion from these “demon worshipping” medical doctors. “Disease is Wrong Vibration. From what has thus far been said, it will be apparent to all that any disease is simply an ‘out of tune’ condition of some part of the organism. In other words the affected part or the body ‘vibrates’ higher or lower than normal. . . I have named this new discovery . . . the Electronic Radio Biola, . . . The Biola automatically diagnoses and treats diseases by the use of electronic vibrations. The diagnosis is 100 percent correct, rendering better service in this respect than the most experienced diagnostician, and without any attending cost.” (The Golden Age, April 22, 1925, pp. 453-454). Even more astonishing than the quack science involved was the direct link to occult practices in this machine. The claim that the medical profession had descended from “demon worshipping shamans” becomes quite ironic when we see how this Radio Biola worked: The patient was told to write his or her name on a piece of paper. A tiny piece, only a dot, of this paper with ink was put into the machine. The machine (or rather, the operator) then somehow answered “yes” and “no” to questions about the patient’s health, reading the “electronic oscillations” of the patient’s organs based on this dot of ink. We draw attention to this information, not in an attempt to embarrass Jehovah’s Witnesses, but to demonstrate the level of ignorance regarding science and medicine, and to enable ones to grasp the source and origins of the present prohibition on blood. It was in this atmosphere where the Watchtower bans on vaccines, organ transplants and blood germinated and took root. While this will come as a shock to current Jehovah’s Witnesses, it was “present truth” or “new light” to readers of the Watchtower Society in the early and middle 20th century and to disagree with it amounted to apostasy – making one subject to disfellowshipping and eternal destruction. The information in this section builds on Prof. M. James Penton’s Apocalypse Delayed – The Story of Jehovah’s Witnesses (University of Toronto Press, 1985), and on extensive quotations and comments published by Ken Raines in his magazine JW Research. What I find so remarkable about the Roy Goodrich story is that 20ish years after disfellowshipping Goodrich for calling out “radionics” as spiritual, the “Society” deemed it spiritual. Yet, I can find no evidence that the “Society” reached out to Goodrich, apologized or invited him back. It seems odd to me that “running ahead” was a more serious offense than spiritism in the “Society’s” eyes. Also, if the practice was spiritism, how does one trust in anything Rutherford taught since he engaged this “spiritistic” practice?